Hilton launched a GoFundMe to help cover costs, which has raised more than $13,000 so far. 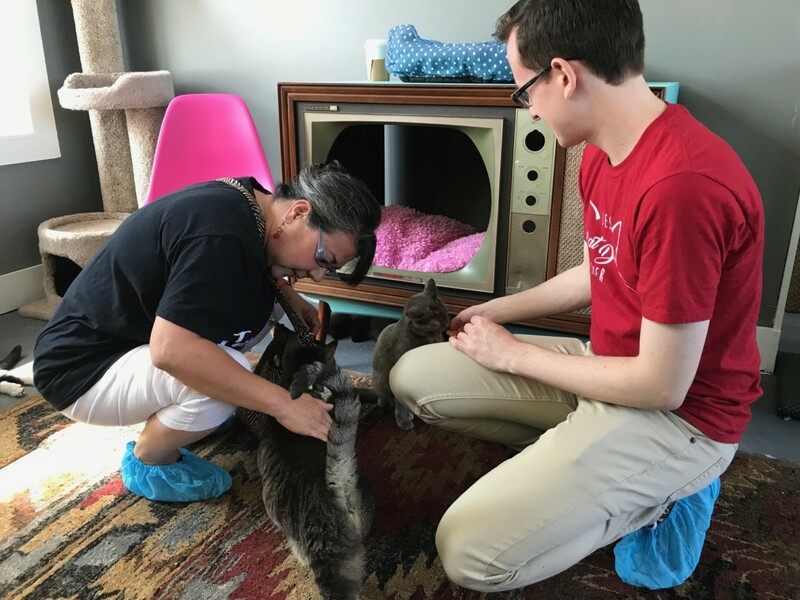 On July 5, she held a soft opening for donors and volunteers to meet the cats. Five of the cats found sponsors that day who covered the $100 adoption fee for when they find their forever home. 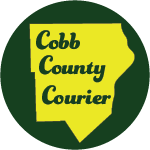 The cats come from the Humane Society of Cobb County, which often pulls cats from shelters where they face euthanization. Lacey, at 12 years old, is a friendly brown and white tabby who has spent six years in a shelter. Temple, a black and white tuxedo, is the youngest at two years old. Two of the first patrons through the door said the barista warned them the cats may be shy and hiding. Instead, they were greeted by the feline residents as soon as they walked inside. 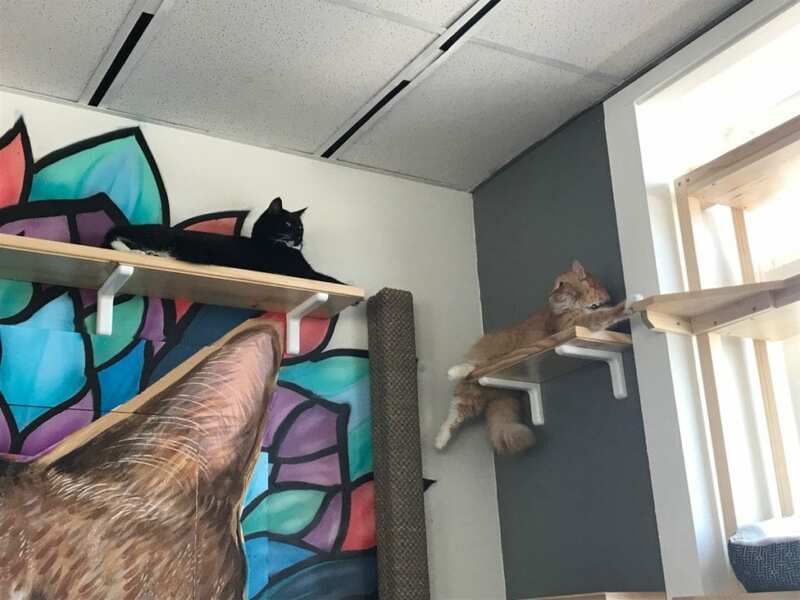 As more customers arrived, the cats became more lively, climbing the shelves, batting at toys and rubbing against the visitors. 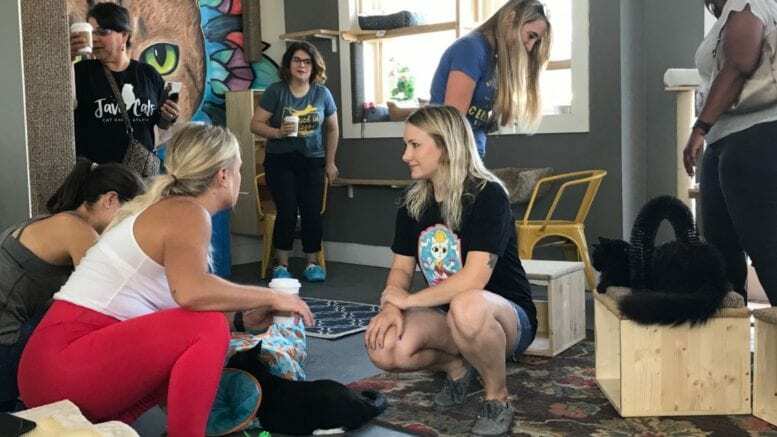 The decor includes bean bags, couches, old hollowed-out televisions, tables and painted murals. Linda Icard came all the way from Portland for the opening. Her daughter lives in the area and she was already planning a visit. She said she selected the dates for her trip when she saw the plans for opening weekend. Before she left to also visit the Grant Park location, she decided to sponsor one of the cats. The cafe and the cat room are two distinct spaces separated by double doors. 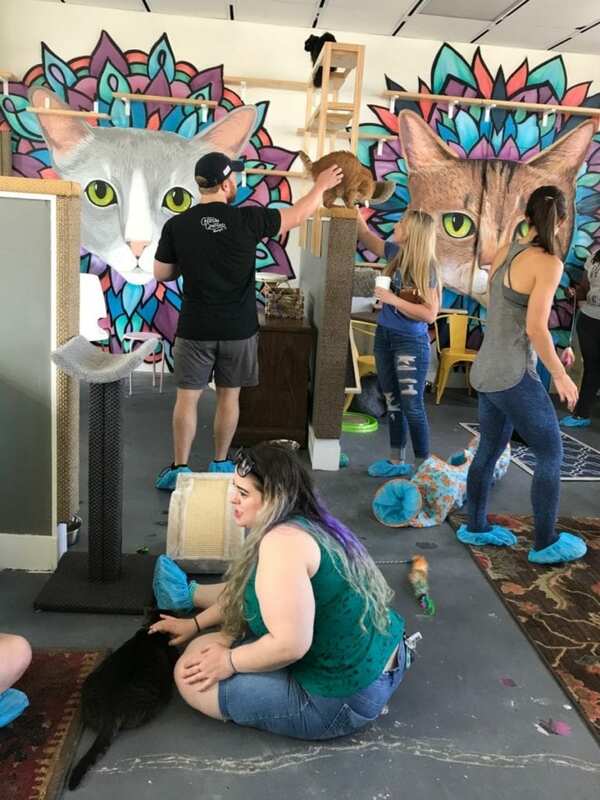 Though patrons can take their coffee into the cat room, the cafe area also has tables and chairs for those who are just dropping by for a treat. Patrons who wish to visit with the cats are advised to make an appointment online in advance. Walk-ins are first-come, first-served based on space available. Adults are $10 for an hour, and children 12 and under are $7. A drip-coffee or tea is included in the cost and kids can have a hot chocolate, juice or fruit snack. For $2.50, customers can upgrade to a crafted beverage. The admission helps cover the cats’ expenses. 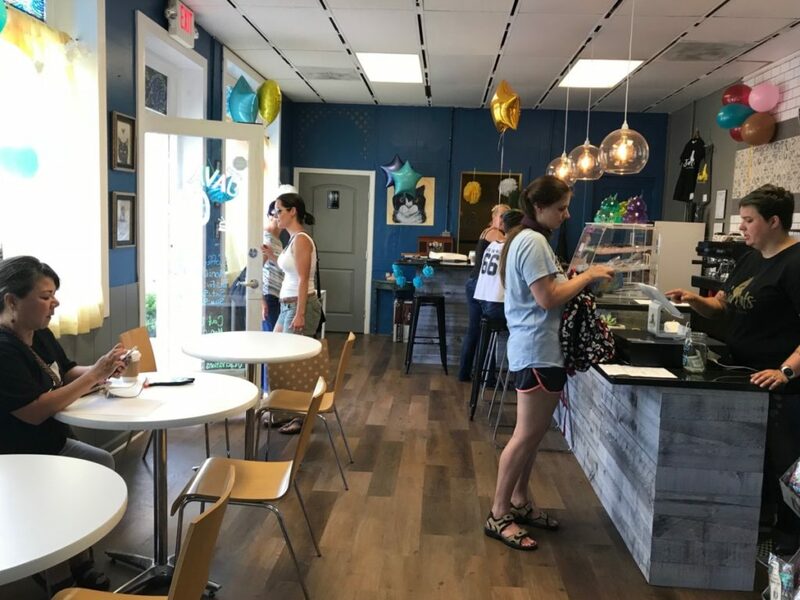 Java Cats Cafe is located at 85 Atlanta Street SE, Marietta. There are eight spaces in front and additional shared parking in the back. 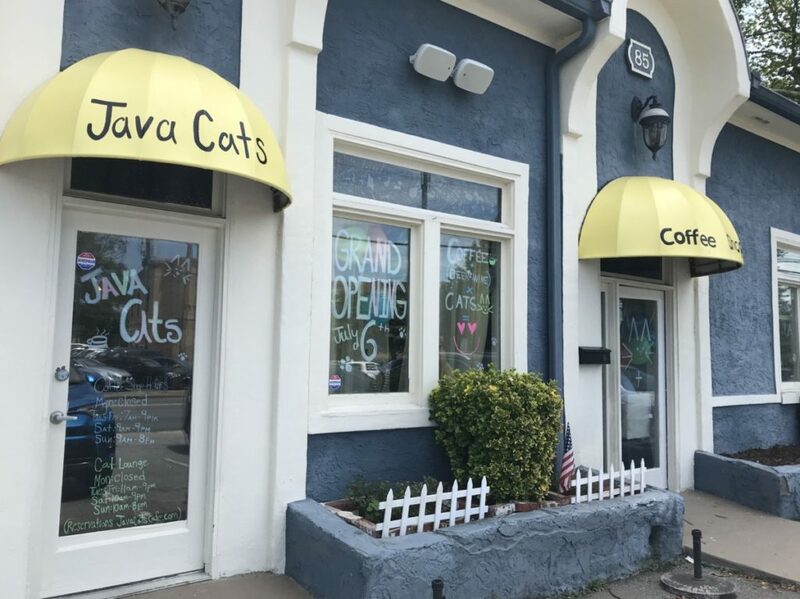 Be the first to comment on "Java Cats Cafe opens near Marietta square"